Henry and Pauline Durant, the founders of Wellesley College in 1875, were committed to the liberal arts education of women and by the 1890's the school's curriculum was revised to include study of all the major sciences and the development of state-of-the-art laboratory experiences for its students. In 1920, Dr. Margaret Ferguson, Chair of the Department of Botany, initiated the construction of the greenhouses (now the Margaret Ferguson Greenhouses) and requested that over 20 acres of campus (that had formerly been a golf course for students) be set aside for exclusive use of the Botany Department. 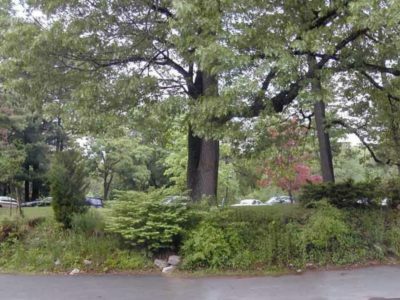 In collaboration with Dr. Helen Davis, also in the Botany Department, they eschewed the beaux-arts design that landscape architect Arthur Shurtleff had deployed elsewhere on campus and laid out a more naturalistic design that included an artificial waterfall, a stream with intermittent small pools and a terminal pool, along with open fields, bog, bird habitat, wildflower garden, rock garden, scree, azalea hill and woodland garden. Plantings contained a representation of as many of the plant families as possible to allow students to compare similarities and differences among genera and species. 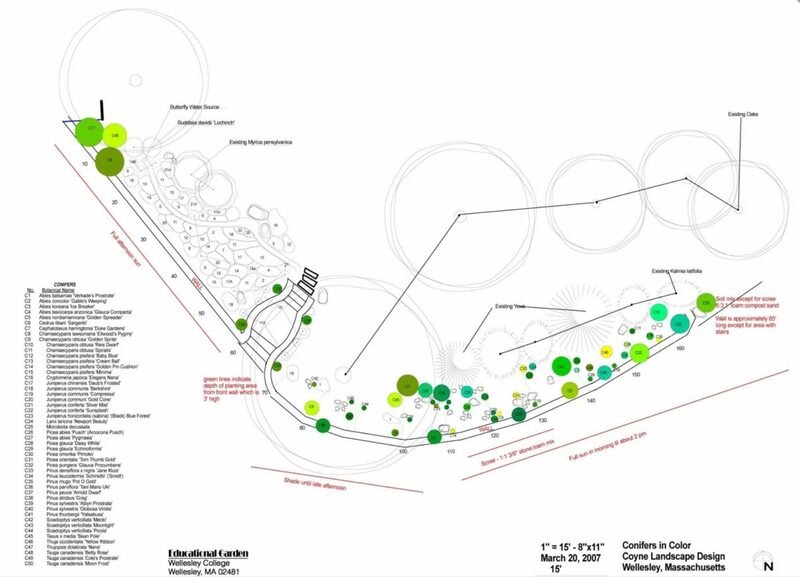 With the arrival of a new Director of the Botanic Gardens and Greenhouse in 2005, Dr. Kristina Jones, there has been a revision of the plantings. The Educational Garden, which contains the Conifer Reference Garden, was one of the first major changes. A perennial and weed infested embankment along the drive approaching the Greenhouses (Fig. 1) was designated the site of the Creighton Educational Garden in memory of Harriet Creighton, Professor of Botany from 1940 to 1974. Dr. Creighton's focus had always been botanical education so this was an appropriate memorial. 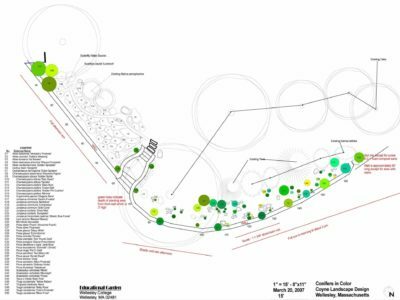 Dr. Mary Coyne, Professor Emerita of Biological Sciences, who also has a Certificate in Landscape Design drew up the original design (Fig. 2). 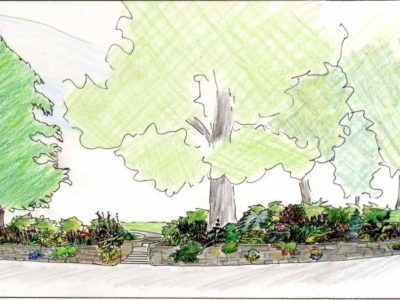 The gardens were set off by a fieldstone wall and steps leading to the Botanic Gardens proper and included a conifer garden, butterfly garden, rock garden and scree, replacing garden areas that had been lost from the original Botanic Garden design (Fig. 3). 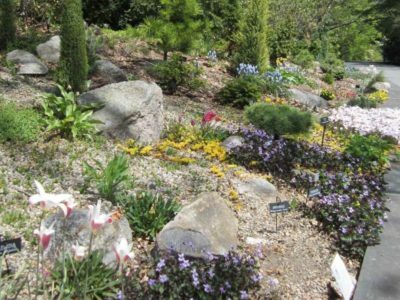 Because of the defined space, the conifer garden was limited to dwarf and miniature specimens as well as some prostrate forms of standard species. Dr. Coyne, who knew nothing about conifers, spent the winter after construction pouring through books and websites to pick representative conifers that would display differences in leaf structure, shape, and color including changes in color and leaf retention over the winter. Two knowledgeable and long-standing members of the American Conifer Society, Gerald Kral and Elmer Dustman, vetted the final choices. The wall was built in August 2006 of field stones and capped with a bluestone. The stairs were designed to provide seating along the wall and a space for people to aggregate at the beginning of tours (Fig 4). It has also become a popular luncheon spot. 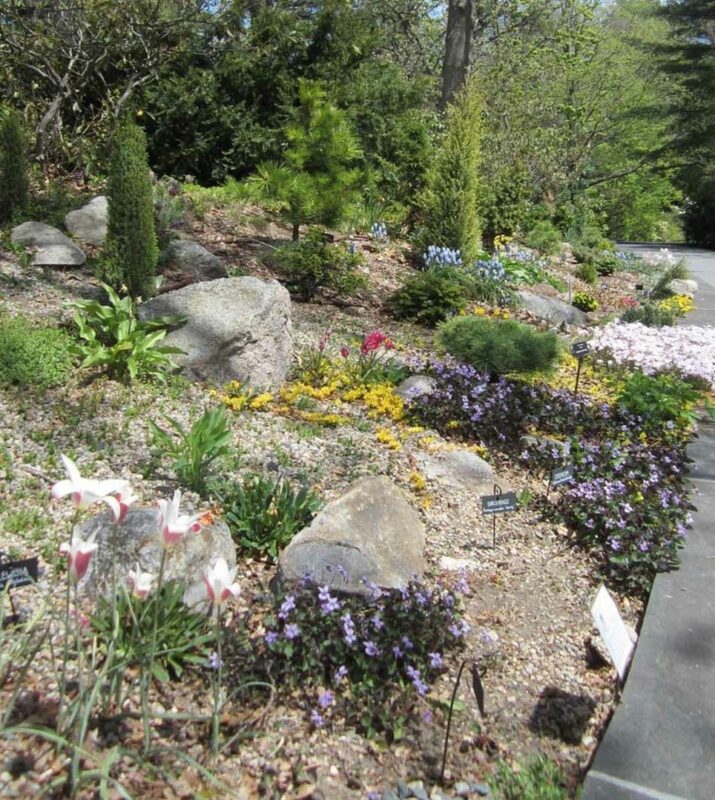 The planting area was layered with large sitting rocks that were located near the butterfly garden and the remaining stones were carefully placed throughout the conifer area with a larger accumulation in the alpine scree. Rock garden plants would be placed around the stones to complement the conifers. The conifers were planted in the spring of 2007 and were distributed throughout the entire garden area to maintain winter interest. Most of the plantings have survived well except for Picea planted in the scree. 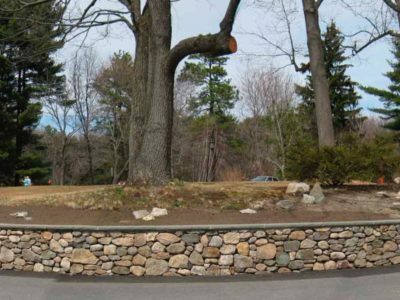 The Harriet Creighton Botanic Garden Fund and the Friends of Horticulture paid for the wall; initial conifer specimens were supported by the plant budget for the Wellesley College Botanic Gardens, but there were still items that were needed. In winter of 2008, the American Conifer Society recognized the area as a Conifer Reference Garden and we requested and received funds for a drip irrigation system, commercial labels, additional and replacement plants, student help in maintenance, and publicity materials. Each section of the garden contains a sign with information and a QR code which directs the visitor to more information on the Wellesley College Botanic Gardens website. We are also beginning to experiment with the use of conifers in troughs and our initial trough is displayed in the Cameron Garden across the way next to the Greenhouses.